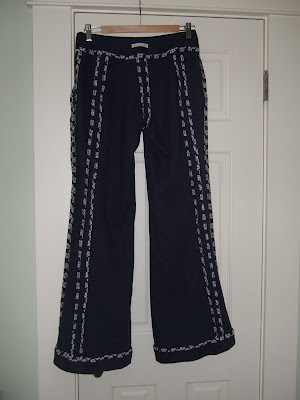 Finally I am writing my review of the Hot Patterns Pirate Queen Ahoy There sailor pants! From PrintSew, I got a custom sized pattern - I inputed my height, bust, waist, and hip, and received a link to print the pattern. There were no instructions included with the PrintSew download. I emailed PrintSew asking if they were available and I did not receive a reply. So, none of the chatty talk that usually comes with HP, I was all alone on this one! There were no notches/matchpoints provided but the pattern pieces were labeled appropriately and grainlines were indicated . They were not marked as to how many you need to cut (i.e. ‘’cut 2 fabric, cut 2 interfacing’’) but it was pretty easy figure out. The buttonholes and button placement was marked on the pattern pieces. Pieces that can be cut on a fold were not marked as such, like the CF and CB waist facings. The seam allowances were included, so I just removed the seam allowance when I traced the pattern pieces if I wanted to cut the piece on a fold. I like that the fit was pretty great straight off the printer. There were 4 pattern pieces for the legs, 2 in front and 2 in back, this allowed for nice shaping around the derriere in particular. The alterations I made were more like design changes. 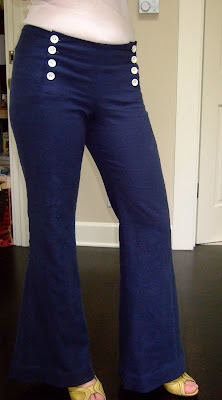 Reduced the flared legs – As drafted, the bottom hems were >32 inches around – woah! I used the slash and pivot method to take out some of the fullness - I slashed from the hem to the knee, then overlapped at the hem; I did this with all 4 leg pattern pieces. Added rise to front and back – These are designed to be very low rise; as drafted the rise was 7’’ in front and 11.25’’ in back. I added 2’’ in front and in back for more coverage at the waist/belly. 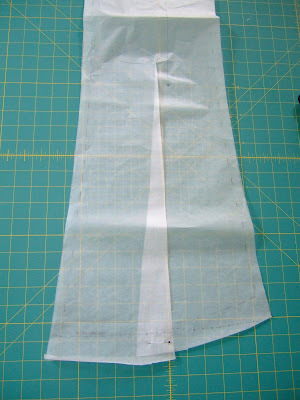 Eliminated the flared hemline – The hemline is shaped so that the back of the leg is ~3’’ longer than the front. 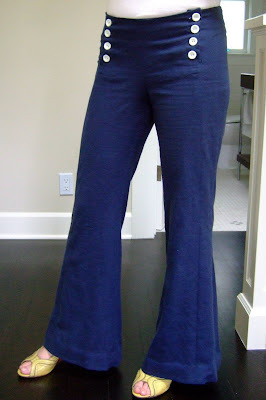 I really like this but I ended up removing most of that difference since I may wear these pants with flats. Eliminated gaping at CB waist – I had the oft-seen gaposis at the CB seam at the waist so I just pinched that out when redrafting the pattern piece. I’d love to sew this again, and I know it’ll go much faster next time! I’m keeping my eyes peeled for a lightweight stretch denim for another summertime pair. If I were to make this again, I would use larger (1’’) buttons and space them out a bit more, also I would move each line of buttonholes in another ~0.5’’ towards the center. (I used ¾’’ buttons because that is what was drawn on the pattern pieces. Those look really cute on you! Nice job. Really Christina. This is so helpful. Seeing how you use the Hong Kong finish, the way you took the fullness out of the pant and reading about your alteraions. And they make you bum look fantastic! They kind of fit like a jean don't they? I forgot to add that I am 100 percent in love with your shoes! i love the button front. and the HK seams are a bit swish too. This turned out very well and looks so smart with that top. I concur with your button plans for next time out. The center panel has a wider proportion than the sailor pants I recall my dad wearing, so moving them in and using larger buttons appeals to me. Really cute. You are my hero! I'm new to sewing and found the lack of clear instructions so confusing. Your photos and notes helped so much, I just finished them now.